Labour MPs rushed to greet the chief architect of New Labour, many carrying wooden stakes, garlic and crosses. 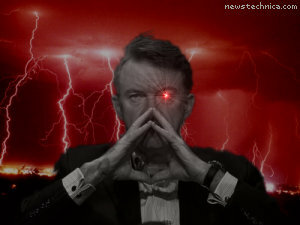 Mr Mandelson has had a chequered career in office. Previous Cabinet terms have ended with unfortunate resignations due to being beheaded by angry villagers, burnt at the stake, wrapped in chains and thrown to the bottom of the Volga and, in one case, nuked from orbit. David Cameron was unavailable for comment, with only the sound of cackling glee and champagne corks audible on the line. An as yet unnamed elite, lawless organisation is actually running the country by stealth, in effect a silent insurrection from within. The control must be total, absolute, and lead top-down from the centre. What and who cannot be controlled must be destroyed by nulabor. An unelected cadre already runs the country, bypassing Parliament, the Judiciary, and all the institutional safeguards that were designed to ensure our freedoms. This nulabor government is corrupt. The nulabor corruption is absolute, lead from the top down, imposed through all tiers of social and government control, down to street level. Being rotten to the core and from the core, everything it touches it taints. Having neither the ability nor inclination to correct itself, outside intervention is indicated. in response to the above comment do you know who Dave tory boy upper class twit Cameroon is? People like you can’t wait to get him back in, because like the cap doffing serf that make up most of this country you just lurve to be ruled by your upper class masters! I’d rather have Mandelson in power any day: at least he is a thinker and not some upper class twit like your careerirst Dave.